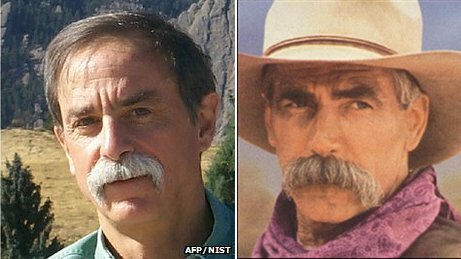 Completely relevant to today’s discussion: David Wineland totally looks like Sam Elliott. My previous post about the Nobel Prize in physics focused on the science, despite the fact that the prize is given to a small number of individuals. The rules forbid granting the prize to more than three people, no matter how many actually engaged in the research, which is why last year’s physics prize left out a large number of researchers who contributed to the discovery of cosmic acceleration. Don’t get me wrong: I’m not saying Perlmutter, Riess, Schmidt, Haroche, Wineland, and all the others are unworthy of recognition—far from it. The editors of Scientific American called for a change in the policy, to allow collaborations to be acknowledged, which certainly would help. Think of it this way: who gets the Nobel Prize for the probable Higgs boson discovery this summer? The theorists who predicted the existence of the Higgs boson, and if so, which ones? The experimentalists who found the particle, and if so, which ones? Of course, another part of the problem is that the Nobels aren’t really the arbiter of good science. A lot of good research goes on that the Nobel Prizes never acknowledge, because it isn’t sufficiently groundbreaking (in the view of the committee), the researchers are dead (the prizes are rarely granted posthumously), or possibly it’s too hard to figure out which researchers to award (getting back to the whole collaboration-vs.-individual issue). Carl Zimmer eloquently expressed these and other problems with the Nobels last year, so I won’t go on. 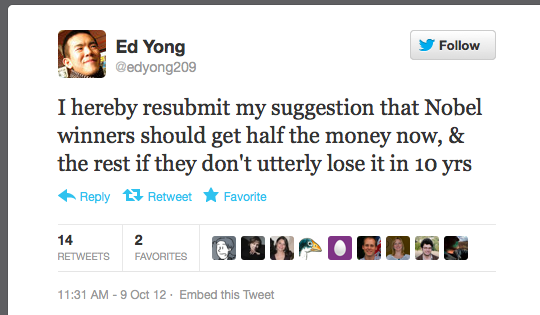 As Ed Yong’s tweet above indicates, Nobel laureates are also fallible humans, not demigods. Many laureates have embraced pseudoscience, crackpottery, racism, sexism, or just gone plain nuts. Brian Josephson was a promising researcher in superconductivity, but even while he was doing excellent science, he became a true believer in psychic phenomena and gave up experimental physics in favor of paranormal research. Laureates William Shockley (one of the developers of the transistor) and James Watson (co-discoverer of DNA) both have made publicly racist statements. Being brilliant in one area doesn’t mean one is immune from being a fool in another, but the prestige of the Nobel Prizes can sometimes make us forget that. So that’s partly why I focus on the science, not the scientists, when I cover the prizes. I’m excited by the physics itself, which at its best helps us understand the wonderful Universe we inhabit. The Nobel Prizes properly should highlight the human face of this research. In fact, the Nobel Foundation rules specifically prohibit posthumous nominations. Originally, nominees who died after their nomination remained eligible (for which there are two cases); now, the recipient must be alive at the time the awards are announced. The case last year of Dr. Steinman was close enough to that limit that some debate over his eligibility occurred.